Failed to send the e-mail notification. Like alot of other people, I get this error. I filled in everything correcty like it's supposed. E-mail address, From, Outging mail server (SMTP), Port. I don't use any form of authentication, it's not needed on my mail server. But still somehow I get an error related to authentication.. Anyone got an answer on this? Can it be a bug in the Acronis Drive Monitor software? or is it unable to communicate with zarafa? What happens if you leave the port at its default setting or use a different email address if available? - Leave the port at its default. - Use a different email address. I tried those both, but still it doesn't send an e-mail notification. This limitation (unauthenticated email account) exists in many of Acronis's products. The only work around is to use a different email account that requires authentication. I have my customers use a GMail account, and set up forwarding in GMail using filters to only forward the Acronis messages to their primary email account. 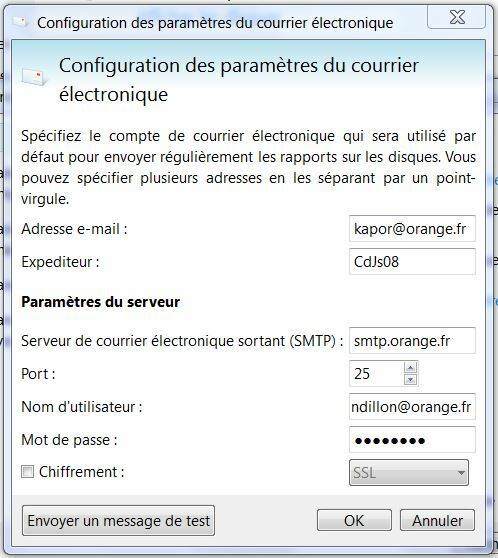 Je souhaite connaitre par email les incidents disques rencontrés. Je n'arrive pas à remplir correctement la "configuration des paramètres du courrier électronique"
The "Events" tab of "Disks" show numerous events of High temperature. After I have corrected the problem, how do I get rid of all the old events?